You just joined Robin Hood's merry men in Sherwood forest. You can help at the Sherwood forest camp, rob travellers on the road to Nottingham castle, bring messages from Robin, and scout the neighbourhood for information. 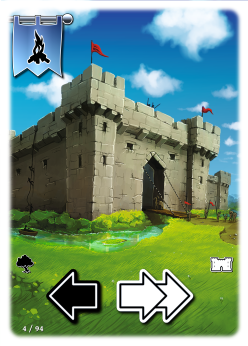 The more risk you take the higher the rewards, but be careful : If you get too close to the castle you will need to go back and hide in the forest before the sheriff's guards can catch you! You want to be the first to accomplish 7 missions of the same type in order to become Robin's new lieutenant. Of course your friends want to become lieutenants too so you will have to be swift and daring to succeed before them. There are 6 sets of missions : Fetch food, Steal animals, Steal riches, Steal weapons, Scout places and Bring messages to and from characters. The first player who has collected 7 Mission cards of the same kind (same icon) at the end of a player turn wins the game. Robin revisits the Happy Families classic game with a clever movement and trade system that keeps all players engaged during the whole game. Please note that Robin features high quality 100% plastic cards. These cards handle lightly, and are very resistant compared to paper cards. They also shuffle very well, and can safely be used without protective sleeves. Robin is a fun, past-paced, action-packed game for the whole family.